With 43.6 million Americans living in poverty and the real unemployment rate at 15.9 percent, many New Yorkers are turning to the informal economy to scrape by. Street vendors, bucket drummers and day laborers fill the cracks in the formal economy, as do canners. 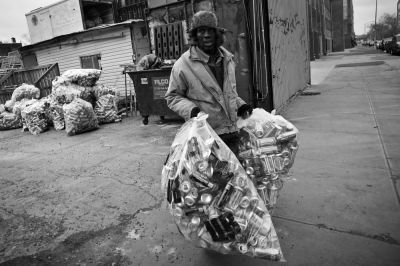 Un- and underemployed New Yorkers who collect bottles and cans report earning an average of $40 a day. Immigrant canners are often undocumented and have no recourse to unemployment benefits or public assistance in the recession. Their numbers have ballooned in relation to the old guard, so to speak. “In the early 1980s it was nothing but black people doing cans,” says Eugene Gadsden, a former can collector and community activist. Conversations with 40-odd canners at supermarkets and redemption centers throughout all boroughs but Staten Island found that the majority were first-generation immigrants who had started canning within the past three years. For the most part, they are not homeless, but are on the edge. Some have been laid off recently, others work meager-paying jobs. Scavenging has a long history. Until the end of the 19th century, scavengers took care of the bulk of waste collection in many U.S. cities. During the Great Depression, the jobless collected scrap metal to earn money. While dump scavenging was banned in the 1950s, collecting recyclables resurfaced a few decades later as states passed returnable container laws. Today, only 11 states have bottle bills, which require consumers to pay a refundable deposit on beverage containers. In 1982, well before the city’s Department of Sanitation implemented municipal recycling in the 1990s, New York State passed the Returnable Container Act. The act required a five-cent deposit on beer and soda containers and provided an unplanned source of income to hundreds of homeless people in the city. Canners were born. Gadsden, 53, was one of the original canners. A tall, African-American man with halting speech and a warm smile, he says he moved to New York City from Charleston, Va., because of a girl when he was 19. He sold ice cream for a while, but eventually lost his job and started living on the street. As a rookie, Gadsden brought in $2 to $3 per day, but after perfecting his trade and kicking his crack habit, canning afforded him his first apartment and earned him the title of “King of the Cans” on PBS’s NOW. Gadsden’s cousin, Jean Rice, 71, has a husky voice and dusty gray eyes and wears an over-sized tan suit jacket. In the early 1980s, he was living with his aunt in Connecticut and studying criminal justice administration when she was murdered, and Rice was left homeless. So he started collecting cans with Gadsden. Canning is a grueling occupation. Canners routinely work up to 12 hours a day combing through public trash bins and curbside recycling (which is not illegal if you’re on foot). Because they can’t bring their valuables into shelters, canners are forced to spend the night sleeping outside with the day’s collection, waiting for the supermarket or redemption center to open in the morning. 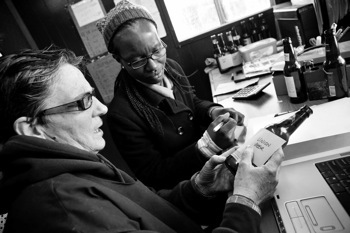 When the only nonprofit redemption center in the city shuttered in 2005, supermarkets with “reverse vending machines” were the only option for canners in Manhattan. Grocery stores often refused to redeem the full $12 worth (about one garbage bag full) of cans required by law, according to Picture the Homeless (PTH), a grassroots homeless advocacy organization. Even if stores did accept the full amount, canners still had to lug their bags around to different grocery stores to redeem a day’s worth of cans. Gadsden and Rice joined other homeless canners and formed the Canners’ Committee at PTH to organize around canners’ rights. The committee succeeded in getting then-Attorney General Eliot Spitzer to force supermarkets to comply with recycling laws. They also pushed Albany to pass the Bigger Better Bottle Bill, which became law one year ago. As a result, bottled water now carries a deposit, there are no longer limits to the number of cans and bottles a supermarket will redeem and 80 percent of the unclaimed deposits that used to be returned to the beverage industry are diverted to a general state fund. 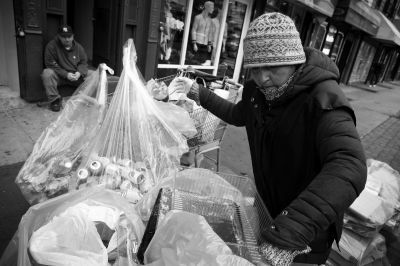 In 2007, Gadsden and Sister Ana Martinez de Luco, a canner from Spain who is homeless by choice, started Sure We Can, the only nonprofit redemption center in the city that specifically caters to homeless canners, located in Bushwick, Brooklyn. De Luco dreams of one day linking the canners’ movement in New York with waste pickers worldwide. “I want to work to get a positive view of this huge work which is the only way to survive for millions in the world,” she says. Canning has seen a boom in recent years, and not just because water bottles now carry deposits. While a 2005 survey commissioned by PTH found that there were around 1,000 canners in New York City, de Luco estimates that there are now thousands of can collectors throughout the five boroughs. Donald, 55, a tall, thin African-American man, was laid off from his job as a checker at a grocery store three years ago. He gets food stamps and his wife helps out with rent, but canning helps pay the bills. He’s not ashamed of what he does. “People look at it like a Great Recession type of job. These days you can’t be choosy,” he says. The canners that scour the city each day take care of a good portion of the city’s recycling. Picture the Homeless estimated in 2005 that canners redeemed 12.7 percent of all returned beverage containers, and that number is likely higher today. Sure We Can has garnered city interest through the amount of cans that people redeem at their center. De Luco said the Department of Sanitation recently stopped by their offices to inquire about the abrupt decline in the volume of residential recycling. 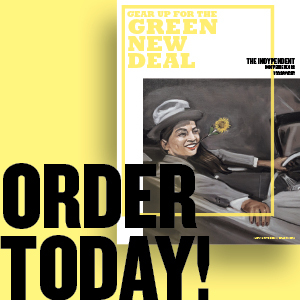 In the absence of a massive green jobs initiative by the Obama administration, canners unwittingly connect the dots between a floundering economy and domestic green jobs. The White House estimates that the $80 billion invested in clean energy projects through the Recovery Act created 267,341 jobs, but not enough people are feeling it. Rev. Earl Kooperkamp, who worked with the canning committee at PTH, says the work canners do points toward the potential for green job creation, if only in the abstract. “The bottle bill shows us in a really crude, not very intentional way, that the possibility is there. Now let’s go about it not as a backhanded side effect. If we did it intentionally, just imagine the things we could be doing, ” Kooperkamp says.